Renowned author and former Liberal Party of Canada leader Michael Ignatieff delivers a stirring meditation on contemporary politics and the lessons he learned in defeat. Candid and utterly unexpected, this book is not just for Canadians concerned about the future of the Liberal Party, but for all citizens concerned about the future of Canada and of political discourse in today's increasingly partisan world. Vermeer’s images captivate us with their beauty and mystery: What stories lie behind these stunningly rendered moments? As T imothy Brook shows us, these pictures, which seem so intimate, actually offer a remarkable view of a rapidly expanding world. Moving outward from Vermeer’s studio, Brook traces the web of trade that was spreading across the globe. Vermeer’s Hat shows how the urge to acquire foreign goods was refashioning the world more powerfully than we have yet understood. A native of Toronto, Timothy Brook has taught Chinese history at the University of British Columbia since 2004. He was appointed Shaw Professor of Chinese at Oxford in 2007, but returned to UBC in 2009, where he holds the Republic of China Chair in UBC’s Institute of Asian Research. An honorary professor of East China Normal University in Shanghai, he holds an honorary doctorate from the University of Warwick. Primarily a historian of the 16th and 17th centuries, Brook also works on Japan’s wartime occupation of China and human rights in contemporary China. He has written eight books and edited nine, in addition to serving as editor-in-chief of the six-volume History of Imperial China from Harvard University Press. Brook lives on Salt Spring Island with his wife, Fay Sims. 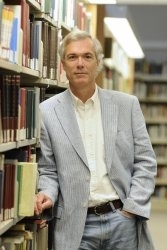 Timothy Brook is currently considered a "single author." If one or more works are by a distinct, homonymous authors, go ahead and split the author. Timothy Brook is composed of 2 names. You can examine and separate out names.